I then remembered that Privoxy is a local proxy server used to filter ads & web pages in general, & it could be used as a local proxy with the authentication added for the main proxy. 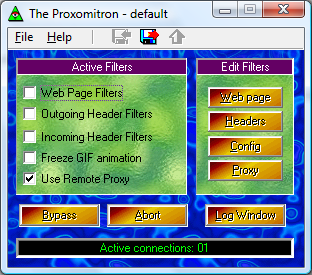 However, while looking at the Privoxy page on wikipedia, I came across another program called Proxomitron (the developer has unfortunately passed away, but the program lives on) that does pretty much the same thing & is primarily GUI driven (Privoxy has quite a few config files with a frontend, but not as simple to use). 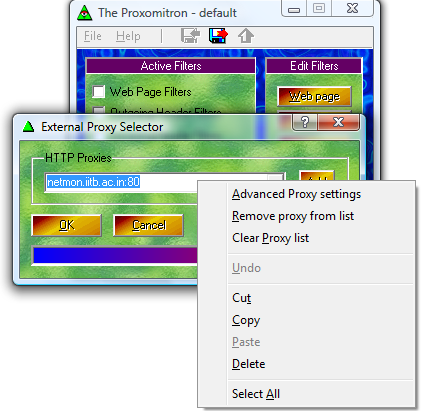 That’s it and you should now be able to use the programs that make use of the IE proxy settings to connect to the internet. 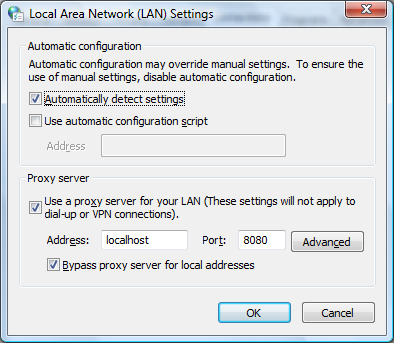 In case any program has its own proxy settings without an option for entering the proxy authentication, just use the same settings as in step 4 & it should work. In fact, you can also use this setup for your iPod Touch/iPhone – you’ll just have to replace the “localhost” address with the IP of your computer, and of course have them both on the same network – to make your net connected Apps work.